It was a beautiful morning to enjoy our morning swim with Skye being first in the water quickly followed by Terry-Jack. Once everyone was recovered under a hot shower it was straight into the usual morning duties and then breakfast. The breakfast dishes were cleared and the trainees gathered into the saloon for a Tatu session, this is when trainees can bring up an problems they may be having if need be, this was followed by a briefing of the day and the trainees were then asked to allocate the jobs they most desired to get us to our destination and plan the activities ahead. Milly and Sabastian helped with anchor duties. Connor, Zac, Ahi and Skye were in charge when hoisting the sails. Julian and Terry-Jack were in charge of the steering and navigation. Mya, Hayden and Niamh were the allocated safety officers and Tamatu was the team leader. We set a course for Waiiti, on Moturoa island, lifted the anchor and set the sails and off we went. It wasn’t long before we arrived. On arrival we lowered the headsails, fore sail and dropped both the anchor and tender and headed for the beach. 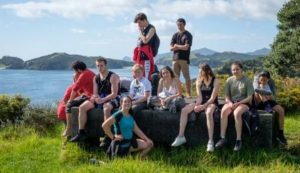 The trainees began the loop walk on Moturoa. Along the way we explored the army bunker located on the island, collected cool items from the beaches and sat down for a game that would allow us to get to know each other a bit better. On arrival back to the boat Sabastian had some lessons on the tender and the crew had a lunch of soup and sausage sizzle organised and it wasn’t long before we hoisted the anchor, tender and sails and set a bearing for our night anchorage in the Te puna inlet. Along the voyage the trainees completed their 30 minutes of silence, some of the trainees enjoyed climbing up the riggin g or going out on the bowsprit, and others just enjoyed the simple pleasures of sunbathing or reading a book. On arrival we lowered the sails and anchor, we are now waiting on a delicious dinner of corned silver side. Before launching the tender and heading into Chynna’s bay for a nice campfire where we hope to enjoy marshmallows over the fire. Sounds like another fabulous day.